It may not be particularly exciting, but the new Kia Stonic effectively delivers everything that you expect from an affordable compact crossover. The new Stonic easily caught our attention with its bright and sporty colors (resembles the Audi Q2 Yellow and Red) in the showroom. It's crossover style and aesthetic overshadowed the Cerato and I sat in the test car the punchy engine and sharper handling left good first impression even while we are still in the driveway. The high torque (from 1500rpm of its 1.0T engine) instill confidence while exiting filtering in the busy Alexandra Road. The engine note was pleasing to the ears more so than Nissan's 1.2T eg Qashqai. Keeping ahead of the pack at the traffic lights was easier than 1.6 naturally aspirated Cerato. With its 7-Speed DCT, the driving experience resembles 1.2T Golf promising fun without risk losing your licence. A very easy car to point and shoot as well as park with its electric hydraulic steering which felt sharper than Nissan qashqai and Ford Kuga. I went down to test drive the car EX mode on 29th Dec. It was placed right at the entrance of the showroom, guess it is the new baby in town. It looks good, no doubt. It looks sporty, young, makes you want to own it. After going through the exterior and interior, i requested the test drive. Oh...Boy, it didn't disappoint. It is only 1000cc but it has the power to move fast. I am driving a 1.6l japan model and stonic is the better one. Very tempted to book one, but my current ride has 4 years to go and decided to hold back. The best part is the price. A whole more than 10k cheaper than vezel. Yes, it is smaller at the back boot, but hey, most of the time our back boot is empty. The weekly visit to supermarket is good enough. It is quiet inside and has the solid feel of European car. To add the icing on the cake, it is from C&C with 10 years engine warranty. 1, the price, a good more than 10k cheaper than japan counterpart. 2, the look, it pleases the eyes. 3, the quality, it feels solid. 4, the drive, no lagging at all because of the turbo. 5, from the C&C, easy of mind. Went to KIA showroom just to see what car they have and the Stonic caught my eyes, love the sport outlook and also the interior design. Apple Carplay comes with it which I like, don't have to install it separately. I really love the exterior looks and it's feature packed interior which really caught my eyes. The torque and also the 1.0T engine is nice to drive with esp the acceleration comparing with the 1.6 naturally aspirated Cerato which I both test drive with. I still won over by the 1.0T and torque engine of Stonic over Cerato anytime. It's a fun car to drive, suspension is good over road bumps! One thing I hope is the warranty coverage from C&C is good, and also the reliability of Kia, never own one before, Hope it don't disappoint me. Went to see it in the morning and booked the car in the evening time. I had no intention of buying a new car as my COE car still had 4 years more to go. However, once I clapped eyes on the Stonic at the 2019 Motorshow, I was won over by its looks and feature-packed interior then when I saw the price, I was even more tempted. The next day, I went down to the Kia showroom at Alexandra and test drove the car. The drive was so much fun! Totally changed my perspective of Kia. I was grinning during the test drive! This car had real punch and darts around corners nicely. Overtaking is an ease on the expressways compared to regular 1.6L NA cars. Best of all, it is a FUN car to drive and will add some zest to your daily commute. Before I made my decision, I compared similar models like the SEAT Ibiza, Honda Jazz, Suzuki Swift but the Kia Stonic won me over with its looks, features and drive experience and not to mention the dealer support and warranty coverage from C&C. Plus, my wife love the looks of this car too! I booked my car the following week and I am super excited to collect it! For those who visited the Car Show held at the Suntec City Convention Centre, you would have seen the amazing deals that Cycle Carriage can give. Was walking around near the Mini Cooper Booth and saw the price of the car from a distance. Was immediately drawn to the car. Went to see the base model as well as the sunroof model. For those who would like to purchase a Stonic, please purchase the sunroof edition. It is really worth the extra 2k. The car is really cramped especially at the back. The car may be well built and pleasing to the eye, however, the company's reliability is dubious. Authorised Distributor Kia cars are Kia Cerato Reviews, Kia K2500 Reviews, Kia Niro Hybrid Reviews, Kia Sorento Diesel Reviews, Kia Stinger Reviews. Parallel Imported Kia cars are Kia K2500 Reviews. sgCarMart is the number one car site for buying Singapore cars, including new cars, parallel import cars, Toyota, Honda, Nissan, Volkswagen, Mitsubishi & BMW. 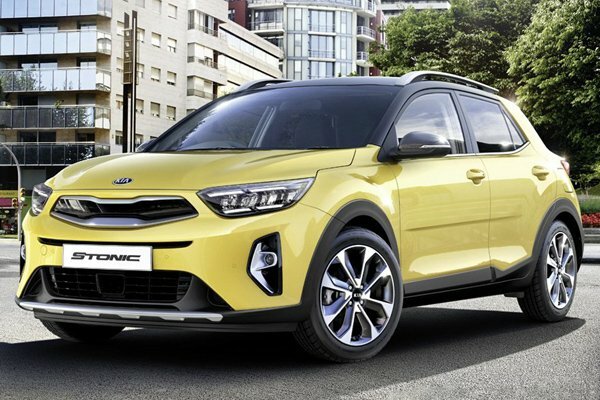 We have new car dealers comprising parallel importers, authorised car distributors, and used car dealers who have the New Kia Stonic latest price Find new car pricelists, new car launches, new car promotions, new car reviews, latest car news & car articles. Read the New.Kia Stonic consumer reviews to help you decide on buying a car. Also join our car discussion and forum discussion for car reviews, motoring news & motoring guides. Visit our partner sites who have job openings for Singapore jobs, Singapore classifieds, mover and real estate properties for sale.